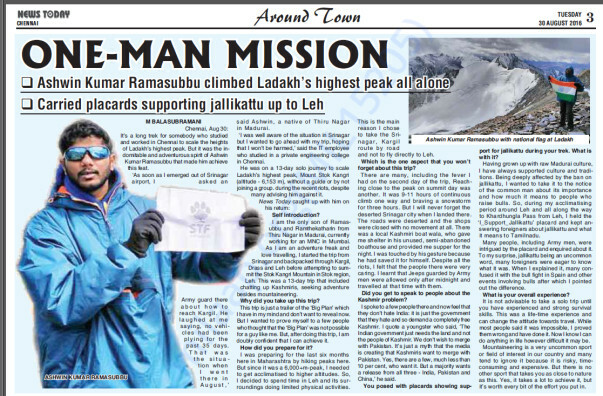 I am Ashwin Ramasubbu, Mountaineer and Social activist. I have been doing campaigns for various social causes. Notably during Chennai floods and Election 2016. Last year (2016) during August I have climbed Mt. Stok Kangri (6153 metres) wihtout a guide or a porter in support of Jallikattu which had a significant impact in spreading awareness. Attaching news articles of the same. Now I have planned to climb Mt. Elbrus 5,642 m (18,510 ft) which is the highest peak of Europe continent. 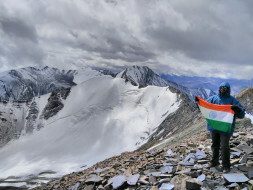 It is the tenth most prominent peak in the world. A dormant volcano, Elbrus is in the Caucasus Mountains in Southern Russia, near the border with Georgia. This expedition is to create awareness against war crimes and Genocides. Also to urge International Investigation for Tamil Eelam Genocide.